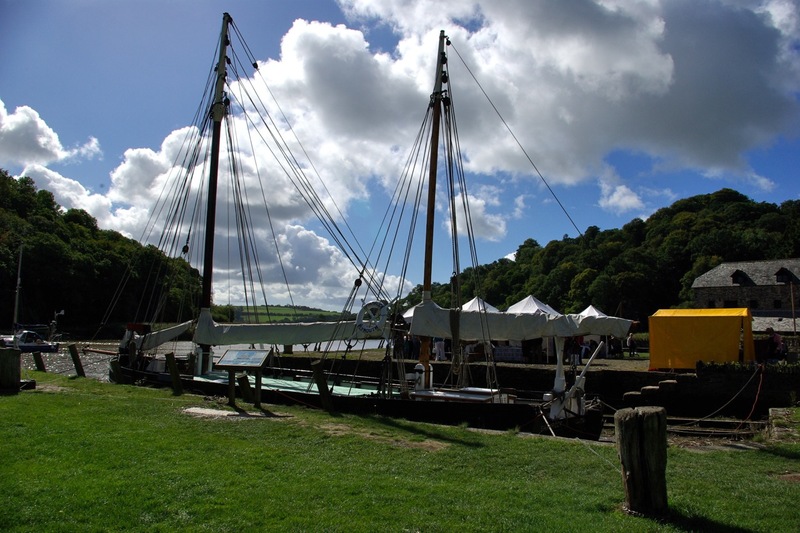 I popped down to Cotehele over the Heritage Open Days weekend. The house wasn’t taking part in the scheme on Sunday so I decided to save it for a rainy day (and when reception wasn’t manned by upper class twits). Instead I went down to the quay. Not only were there the expected pleasures of buildings, views, boats and industrial junk but there was a local food festival too! Lots of stalls selling all sorts of produce from the Tamar Valley. Everything really was local and not as expensive as farmers’s markets can be. Lots of apple juice but disappointingly no cider. By the way Cotehele has talking apple trees in one of its orchards. Yes, the trees use some multimedia malarky and speak in the accent of the area the apple comes from! I look forward to returning and experiencing this. There is a small refreshment kiosk at the Quay but as part of the event there was a cafe tent. It’s the yellow one in the photograph. Friendly people and well made coffee. Their local product was Dutch apple pie made with Tamar apples and currants. I have had Dutch apple cake (and Devon and French) many times and Route 2 in Topsham serve a nice one but Dutch apple pie was a new experience. Whether the fact it was made by a Dutchwoman or I was eating it in its home surroundings it was very good. And dining outside is always good. What is happening with all these new cafes popping up? More places for quality cafe time can only be good I say! 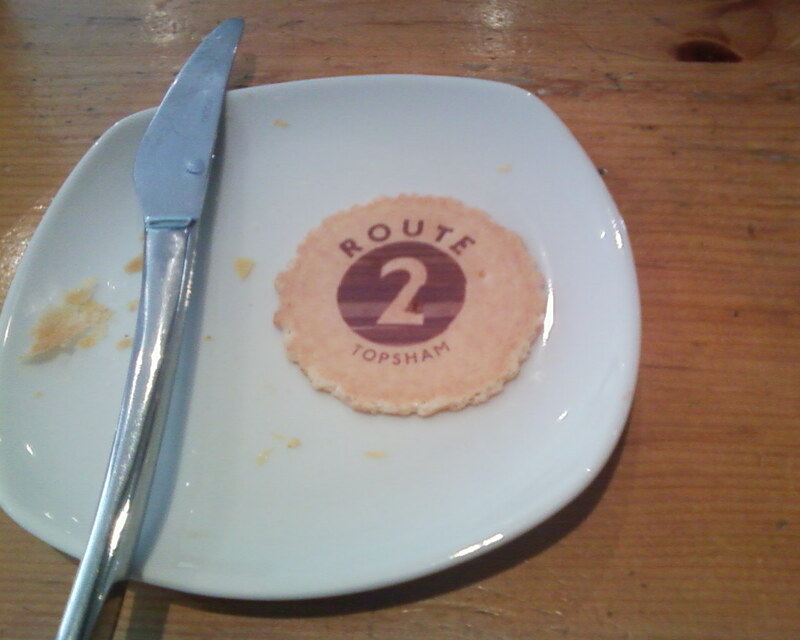 Route 2 is a new cafe in Topsham. But is it quality cafe time? Yes, for two reasons. One is good quality food and drink and the second is a bit radical. They say they are open from eight till eight and serve food all the time – and they are and they do! After going to so many cafes that either close early or stay open but put tables on chairs and clean around you with an hour to go before their advertised closing time, a cafe that is fully open as stated is a treat. The cafe is busy too and the service is pleasant and attentive without being annoying. Their Dutch apple cake is excellent and is the real thing too. A good feature is that lcoal foods and wines are stocked. Including Topsham’s own Pebblebed Wines. Continental in style, the cafe has strong and weak drink available and food is served all day. Close to the quay for parking or bus, and not far from the station either. The name refers to the cycle route that runs through Topsham. You can hire bicycles from the cafe and either pedal up an appetite or fortify yourself for a long ride. Topsham is a lovely place to visit and has good cycle routes and public transport links from Exeter too.